Special deal! One week for $1500! Classic Costa Rican construction with stucco walls, tile floors, beautiful tropical hardwood ceilings and doors, overlooking the Pacific Ocean. Grounds include avocado, mango, papaya, and citrus trees with many tropical flowers. Howler monkeys, iguanas, and parrots frequent the area, as well as many other species of birds and beasts. The house is high enough to have a wonderful view, but is within walking distance of the beach, and the climb back up to the house will keep you in shape while you are away from the gym! Also, the soothing sound of the surf is like a lullaby. 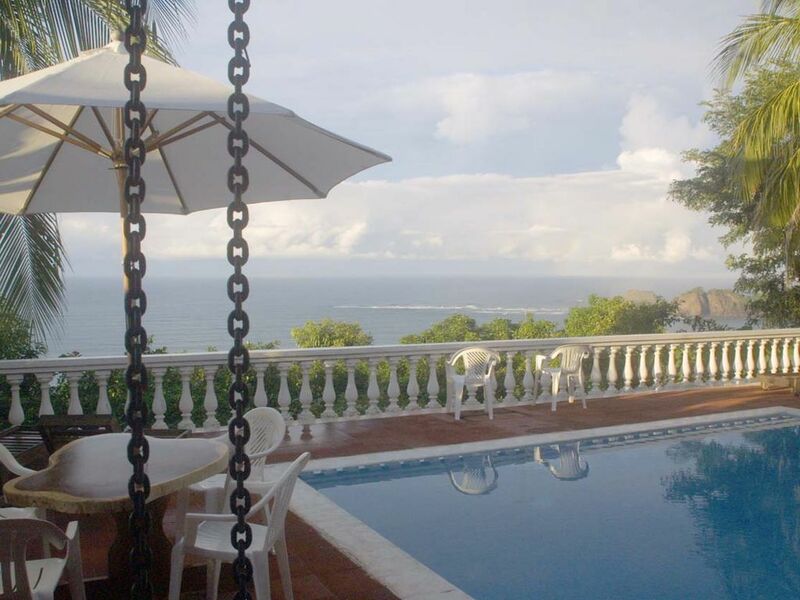 The house is comfortable with a well-equipped kitchen, large dining room, beautiful Costa Rican original art work, newly tiled pool overlooking the ocean, pit barbecue, a wonderful maid, and overall, beautiful surroundings. Also we now have new living room and TV room furniture. SKY TV and VCR/DVD, radio/CD/IPOD player, new TV, high speed Internet and wifi. The kitchen has handmade tile, depicting designs of the local indigenous people, made by a renowned Costa Rican ceramic artist and her husband, a well-known American architectural ceramic artist. It also includes a toaster oven, microwave, gas stove, refrigerator, blender, and nice glasses and china. Pots and pans are adequate for most cooking needs. Telephone service is available with long distance available only with a telephone credit card. There is a washing machine and dryer, and the maid will wash anything you want. There is a wet bar in the living room with a small refrigerator. On the deck are two wooden tables with umbrellas and four wooden deck chairs with cushions. The house comes with all linens but you will need to bring shampoo, etc. Many excellent restaurants, the best sport fishing in Costa Rica, river float trips, surfing on a gorgeous beach, snorkeling at low tide, canopy tour, wonderful area for nature walks. Guatil, a historic village for ceramic work is only about an hours drive from the house where you can see artists at work and many interesting pieces both modern and indigenous. The Flying Crocodile is about a half hour from here where you can take breathtaking ultra light rides over the ocean and coastal mountains. The area is quiet and peaceful with not too much development. The road from Carrillo to Samara is paved which is a great improvement for travel although it is only three miles. Horses are available for rent from Luis Rodrigues--Celenia can contact him for you. Sea kayaking and float trips available from Popo's, owner Tad. A new zip line is available as well as the Flying Crocodile, an exciting ultralight ride. Contact owners for specific info on sport fishing. BR B Area: /B BR This is a beautiful, tropical area of the north coast of Costa Rica. The beach is a large semi-circle lined with coconut palms perfect for relaxing in the shade or venturing out into the sun. Waves can be very large at high tide but smaller and much gentler at low tide. There are tide pools at the west end of the beach and snorkeling is good there at low tide. The mountains make for gorgeous views and sunset can be viewed from the side of the house where the view overlooks two ocean beaches. We are a family from Pensacola, Florida who love our Costa Rican paradise. We have shared it with many people over the years, many of whom have come back every year or so and consider it their home as well. We are college professors, attorneys, farmers/ecologists, scientists, sailors, artists and people who love to have a good time. Villa Mitchell and Playa Carrillo are both secluded non-touristy places which it make the home and the area a paradise away from the commercialism that has taken over much of Costa Rica. There is plenty to do there without condos and highrises! The most beautiful beaches in the world, clean water, wildlife, peace and serenity--also good places to eat, fish, swim, play. Over the years we have improved the property, planted many trees and plants--mangoes, lemons, flowers etc--and restored the house along the way by adding new custom made Costa Rican furniture and Costa Rican artwork. We also have an excellent library from scientific books on plants and birds to the best novels as well as plenty of 'beach reads!' The view from the pool deck of the Pacific Ocean to unrivaled; sitting as the rail overlooking the ocean has become a daily and nightly place to be to relax and enjoy the view, the stars, the monkeys--you name it! Bathrooms are tile with hot water. Towels are new all cotton. Mexican tiles and sink in the master bath. Maid does the laundry. There is a large basket in the hall for your dirty clothes. Nice dishes and lots of hand made pottery--owner is a professional potter. Large fully equipped kitchen--owners love to cook. Large wooden table with matching chairs, chandelier. this is a beautiful home with Costa Rican artwork throughout, handmade furniture from Costa Rican forests, a welcoming comfortable home with many special personal features. A good library---not all beach books! The best horticultural and bird books. Playa Carrillo is located three miles south of Samara on one of the most beautiful beaches in Costa Rica. The beach is a huge horseshoe lined with coconut palms with a rocky headland on each end. There is no commercial development on the beach which adds to its natural beauty. It is in Guanacaste province on the northern Pacific coast in a area that so far is not overdeveloped and still retains the lovely natural beauty without condos and golf courses. You are sure to see parrots, howler monkeys, iguanas, frogs and many species of birds and other animals. It is the perfect place to relax, but there is plenty to do if you want to venture. There are horses, a zip line, surfing, swimming, snorkeling, fishing(some of the best sport fishing in Costa Rica) as well as short day charters that fish close to land. If you decide to rent out home, I will send you a detailed list of things to do and places to go.